The cap for the smallest division in California grew by 100 students a few years ago to 600. What was already a very competitive division became even tougher and this year, we would have the deepest field compete on Saturday. The fastest team time for 3rd place was set by Flintridge Prep in 2014 with a time of 82:37 (16:58 average). We should see a new record this year as several teams head into this meet with their sights set firmly on the victory. The favorite heading into this meet will be Desert Christian, Lancaster. They finished in 3rd place last year and returned their top 6 runners from that team. They have been the top ranked team through most of this season which includes a victory at the Mt. SAC Invitational Division 5 sweepstakes race. The margin to the next best teams has narrowed however as they beat Valley Christian, Cerritos 74 to 79 to win the CIF Southern Section meet. Looming ominously for both teams was the 3rd place team, Flintridge Prep. They have secured 15 podium finishes since the inception of the 5th division at the California state meet in 1996. They are the defending state champions and are definitely in the hunt for another state title. From the northern part of the state, Lick-Wilmerding peaked perfectly at the NCS meet taking down several state ranked team. St. Joseph Notre Dame, College Prep, University and Sonoma Academy all qualified to the state meet behind L-W and will all be aiming for a high finish at state. Crystal Springs Uplands won the CCS meet and is the only non SS and NCS school ranked in the top 10.
Cooper Teare, St. Joseph Notre Dame, won two state titles last year by a total of .005 seconds. 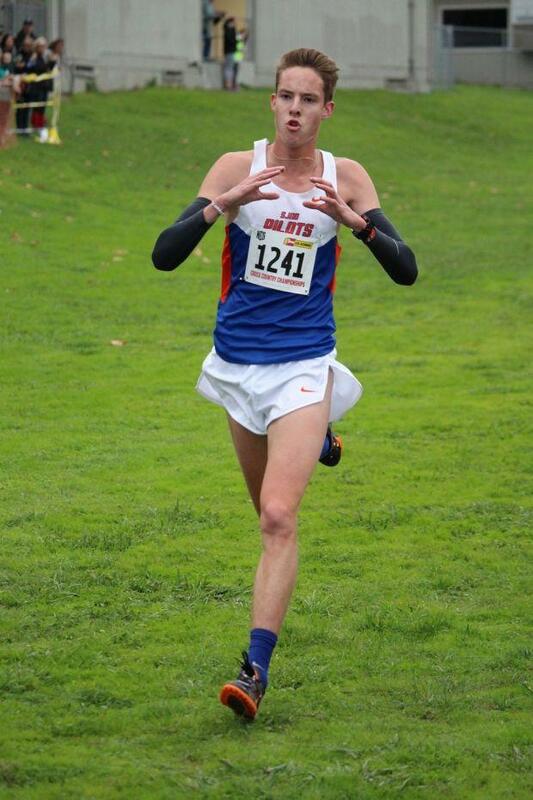 He defeated Jack Van Scoter of Flintridge Prep 15:07.313 to 15:07.316 to win the state Division V title. On the track, Teare defeated Cole Spencer of Great Oak 8:51.845 to 8:51.847 to secure the state 3200 meter title. Teare will now by a heavy favorite to win the state title and break the division record on the course set by Trevor Reinhart, Marin Academy with a time of 14:59 in 2014. Teare will also be racing runners in other divisions for those coveted top 5 individual positions at the NXN meet in Portland. His main competition will be a familiar one from last Saturday's race as Brian Schulz, El Molino, will once again try to tag along with Teare for as long as he can. The other runners in the mix include SS champion, Evan Pattinelli, Flintridge Prep as well as the runners that finished behind him, Joseph Biehl, Desert Christian, Lancaster, Andrew Mitchell, Desert Christian, Lancaster and Ryan Vreeke, Valley Christian, Cerritos. Eli Horwitz, Stuart Hall and Jake Lange, Nueva were also impressive at their section meet and will both by shooting for a podium spot individually. Following the finish of the boys race, there will be a lot of anxious coaches waiting for the results. Following the girls race, the one team that will not be anxious about the results will be Flintridge Prep. They come into this meet as the overwhelming favorites and it will take a monumental upset to dethrone the two-time defending state champions. They easily won the SS final with a score of 31 and have been top ranked team all season. The battle here will be for 2nd and 3rd place. The slight favorite for the second spot will be St. Joseph Notre Dame, a team that could contend with FP through two runners (more on them below). Lick-Wilmerding finished in 2nd place behind SJND at the NCS meet and will need a good performance out of their entire pack to make the podium. Pacifica Christian finished in 2nd place at the SS this past Saturday and will also contend for a top 3 finish. Francis Parker won the San Diego Section and will be aiming for a top 5 finish. Sonoma Academy can compete with a lot of teams in this field up front but will need some help from their back end of the pack. University and College Prep have been consistent state meet participants and will be battling St. Margaret's and Nueva within the top 10. It is very unusual for a two-time defending state champion to be an underdog but that is the case for this race. Rylee Bowen, Sonoma Academy won the state meet individual title as a freshman and sophomore and will be chasing her 3rd title. Mission Bay's Jordan Hasay is the only runner in this division to win 4 straight state titles which she accomplished from 2005 to 2008. The favorite here will be Kiera Marshall, St. Joseph Notre Dame. She finished 2nd to Bowen at the last two state meets but won convincingly over Bowen at last Saturday's NCS final. She will need to gap Bowen once again during the early part of the race in order not to have to resort to sprint finish for the win. Perhaps the most improved runner in the state is Alex Stout, Pacific Collegiate. She ran for Castilleja as a sophomore before transferring this summer. She won the Stanford Invitational and dipped under the 18 minute mark at the CCS meet on the Crystal Springs course. Section champions Bianca Pourmussa, Brentwood (SS) and Brooke Trossen, Francis Parker (SDS) will both be aiming for a top 5 finish. Marshall's teammate, Emily Perez and Bowen's sister, Kate Bowen, will be in the mix for a top 10 finish. Leading the way for Flintridge Prep will be senior Natalie O'Brien.